The Multicolor Angelfish (Centropyge multicolor) is a marine angelfish from the Pacific Ocean. It grows to approximately 9 cm. Care: Keeping this fish in a reef tank is only recommended with extreme caution. 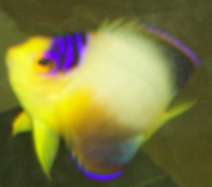 This is a beautiful Multicolor Angelfish! It has been here since May and is doing great!